I've been watching a lot of magic tricks on YouTube lately. David Blaine, Criss Angel, and all that. I've also been watching videos about how such tricks are done. Anyone remember Breaking the Magician's Code? I loved that show. Of course, magicians and movies about them are two different things. 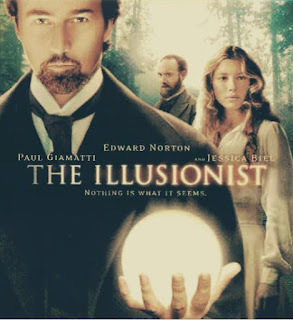 The Illusionist is a 2006 movie that starred Edward Norton, Paul Giamatti, Rufus Sewell, and Jessica Biel. It's also directed by some guy named Neil Burger, who I'm guessing isn't related to a guy named Ham. Never seen it before last night and didn't know jack about it. I figured since Edward Norton was in it then the movie might be good. What I didn't expect was for the true star of this movie to be Paul Giamatti. The Crown Prince Leopold (Rufus Sewell) develops a bit of an obsession with Illusionist Eisenheim (Edward Norton) after watching the Illusionist perform a trick involving the Duchess Sophie (Jessica Biel). The movie starts in medias res as we see Eisenheim summoning what is claimed to be the soul of a woman. The audience is in an intense fervor and police move in to arrest Eisenheim. Then we get to see Eisenheim's childhood as he falls in love with a girl. Obviously, this will all come back into play when Eisenheim meets up with the Duchess Sophie and the Crown Prince. However, the real plot of this movie doesn't begin until the movie is halfway finished. That's the true trick. The movie started out pretty slow and a bit predictable. Like most magic tricks start out, basically. The Duchess and the Illusionist are childhood friends and secret lovers. They want to escape from the grip of Leopold and so they make a plan. But out of a fit of rage Leopold murders the Duchess and the complexion of this movie changes. Eisenheim, desperate for justice, creates the ultimate trick that will bring Leopold's crime to the light. Stuck in the middle of all this is Inspector Uhl (Paul Giamatti) as he tries to sort out the truth. I'm not sure if I'd call this movie an all-time classic or not. I'd have to watch it again to see if the twists hold up under scrutiny. It is a little too slow to set up the trick and the ultimate reveal is a bit too convenient. However, there's no guarantee that the reveal is all that accurate since all we see at that point is how Inspector Uhl thinks the trick happened. That's important to remember. Also, the idea that Eisenheim can actually summon souls is a bit difficult to explain away. That's the one thing in this movie that isn't given some sort of explanation. So the ambiguity allows the audience the more or less choose the truth of this movie. This ambiguity is what really holds the movie, I think. That and Paul Giamatti. The cast is exceptional for the most part. Rufus Sewell gives a performance that's worthy of recognition and Norton is good as always. Biel, an actress I've never cared for, is not in this movie a lot so she doesn't ruin it too much. She's serviceable in her scenes and not given much screen time so I could not have asked for more. All in all, this is a pretty good movie with some twists. Maybe not as good as The Usual Suspects, but it's not too far down the list, either. This is a good flick, I enjoyed it. I saw it quite a long time ago and want to see it again now and see how I think it holds up. Paul Giamatti has some great roles. If you ever get a chance to watch the HBO mini series "John Adams", you should watch it. It might be his greatest role (he was John Adams). A movie that was just released and is freaking great is "Love And Mercy" (a biopic about Brian Wilson). I saw it last night and highly recommend it. Paul Giamatti plays the doctor that was manipulating Brian Wilson (who had mental issues) and tried to steal everything he had. It's a villain role that would be easy to overplay but Paul gives it just the perfect amount of villain Paul Dano and john Cusack are awesome as Brian Wilson (they each play Brian at a different point of his life). Anyway, how's that for hijacking the comment section and making it about Brian Wilson? Nothing wrong with talking Brian Wilson. :) I remember Paul Dano from There Will Be Blood, but I never saw him in anything else, I don't think. John Adams has been on my list of stuff to watch because I did hear Giamatti was good in it. It's on Amazon Prime so I'll give it a watch soon.